The AAS degree in EMT-Paramedic provides the individual with skills in patient assessment, administration of drugs, interpretation of EKGs, the performance of endotracheal intubations, and in the use of monitors and other medical equipment. Graduates have employment options in municipal fire departments, private ambulance services, hospitals, and private industry, and are eligible for taking the NREMT Paramedic Cognitive and Psychomotor exams. 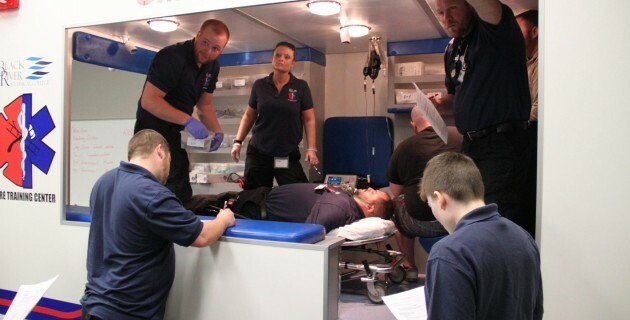 The five-semester Technical Certificate Paramedic program combines classroom, simulation and laboratory training, along with clinical rotations and a field internship to prepare graduates to sit for the NREMT Paramedic Cognitive and Psychomotor exams. Students must hold an active EMT license or certificate to begin this program. This is a one-semester certificate of proficiency. Students who complete the nine-credit-hour emergency medical technician course are eligible for a certificate of proficiency. Upon successful completion of the course and all institutional, national and state requirements, students will be eligible to test for the National Registry of Emergency Medical Technician’s exam. This program is ineligible for financial aid. “The Emergency Medical Technician-Paramedic Program at Black River Technical College is accredited by the Commission on Accreditation of Allied Health Education Programs (www.caahep.org) upon the recommendation of Committee on Accreditation of Educational Programs for the Emergency Medical Services Professions (CoAEMSP), verifies that the following program, Emergency Medical Technician-Paramedic Black River Technical College is judged to be in compliance with the nationally established standards and awarded continuing accreditation on January 21, 2016.